Misti's Tips to Keep Your Pet Safe. Keep your cat inside. Outdoors, cats can freeze, become lost or stolen, or be injured or killed. Cats who are allowed to stray are exposed to fatal infectious diseases, including rabies. During the winter, outdoor cats sometimes choose to sleep under the hoods of cars, where it is warmer. Then, when the motor is started, the cat can be injured or killed in the fan belt. To prevent this, bang loudly on the hood of your car and wait a few seconds before starting the engine, to give a cat a chance to escape. Never let your dog off the leash on snow or ice, especially during a snowstorm. Dogs frequently lose their scent in snow and ice and easily become lost. They may panic in a snowstorm and run away. More dogs are lost during the winter than during any other season. Thoroughly wipe off your dog’s legs and stomach when she comes in out of the rain, snow or ice. Check her sensitive paw pads, which may bleed from snow or ice encrusted in them. Also, salt, antifreeze or other chemicals could hurt your dog if she ingests them while licking her paws. If you own a short-haired breed, consider getting a warm coat or sweater for your dog. Look for one with a high collar or turtleneck that covers your dog from the base of her tail on top and to the belly underneath. While this may seem like a luxury, it is a necessity for many dogs. Never leave your dog or cat alone in a car during cold weather. A car can act as a refrigerator in the winter, holding in the cold. Your companion animal could freeze to death. If your dog is sensitive to the cold due to age, illness or breed type, take him outdoors only long enough to relieve himself. 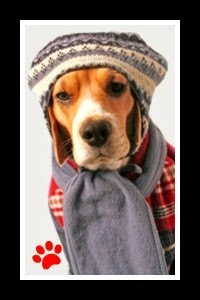 Puppies do not tolerate the cold as well as adult dogs and may be difficult to house train during the winter. If necessary, paper train your puppy inside if he appears to be sensitive to the weather. If your dog spends a lot of time engaged in outdoor activities, increase his supply of food, particularly protein, to keep his fur thick and healthy. Antifreeze, even in very tiny doses, is a lethal poison for dogs and cats. Because of its sweet taste, animals are attracted to it. Be sure to thoroughly clean up any spills from your vehicle. To prevent accidental poisonings, more and more people are using animal-friendly products that contain propylene glycol rather than the traditional products containing ethylene glycol. Call your veterinarian or the ASPCA Animal Poison Control Center if you suspect your animal has ingested poison. Never shave your dog down to the skin in winter. Leave the coat in a longer style, which provides more warmth. Remember that such a style will require more frequent brushing due to dry winter air and static electricity. When you bathe your dog, make sure she is completely dry before you take her out for a walk. Make sure your companion animal has a warm place to sleep far away from all drafts and off the floor, such as in a dog or cat bed or basket with a warm blanket or pillow in it. Your furry friends will thank you with extra cuddles and love!